Kate! We're very happy that you found Iran this much interesting. 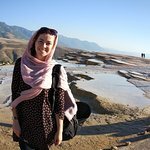 I really recommend TasteIran, both for having a great experience in Iran (which btw, can be paid via an online payment system, which is very convenient) and for the dedication of Amin and Hanieh, who put all their hearts and efforts in developing sustainable tourism in Iran.